Dubai, March 6 : South African captain Graeme Smith signed off on his impressive cricket Test career in 16th place in the ICC Rankings for batsmen announced Thursday. Johannesburg, Mar 5 : Former South African stars have reportedly hailed current Test captain Graeme Smith, who recently announced his intention to retire from international cricket after the Newlands Test against Australia. Smith's late Monday announcement caught South African cricket off guard after saying only three days before that he still had international cricket goals to achieve. According to Sport24, former captains Kepler Wessels and Shaun Pollock have hailed Smith, saying that even though the captain is not the most technically gifted batsman, his leadership and fighting qualities were unrivalled. Johannesburg, Feb 20 : South African captain Graeme Smith has said his team is hoping for conditions at Port Elizabeth that will provide them 'good cricket' in the second Test against Australia, starting on Thursday. Port Elizabeth is also known as the 'Friendly City' and Smith is also looking forward to the usual jovial support from the fans. Johannesburg, Jan 9 : South African Test captain Graeme Smith has said that they would not enter the upcoming series against Australia 'undercooked' and will be better prepared than their last two series. South Africa started slowly in their last two series, losing the first Test against Pakistan in the UAE and it was only a remarkable fourth-innings fightback that saved the first Test against India at the Wanderers. Johannesburg, Dec 7 : Young opening batsman Quinton de Kock's fine form with the bat prompted the South African selectors to ask regular opener Graeme Smith to return to Cape Town and focus on the two-match Test series against India. The former skipper missed Thursday's ODI here at the Wanderers against India due to his grandmother's death. But his absence was not felt as De Kock struck a fine 135 in South Africa's massive 141-run win in the first ODI. If losing the match with Delhi Daredevils wasn't enough, Graeme Smith, the opener for Rajasthan Royals injury has rubbed salt on the wounds of champions of the first season. Smith injured his finger as he caught Sehwag at 75 off 34 balls ending his slaughter on the field. Though, Delhi won the match by 6 wickets but the injury of Smith coupled with the absence of Shane Watson (busy with the Tests in New Zealand till the end of the match) and Indian all-rounder Ravindra Jadeja (banned from this season's IPL) are causing problems for Rajastahan in the third season of this much-hyped cricket format. 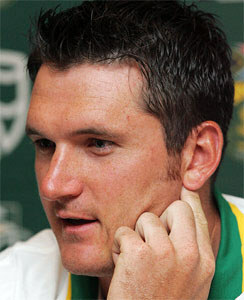 London, Nov 27 : South Africa captain Graeme Smith has described England’s one-day team as a “formidable force”. England have won the last six ODIs between the two countries and another victory today would ensure they are in an unbeatable position in a series reduced to four matches after the Wanderers wash-out. Smith said the toss was not as much of a factor any more with less grass left on the pitch, but you can bet your bottom rand whoever wins the toss will bat first this afternoon. Johannesburg, Nov 13 : South African skipper Graeme Smith has said that he is amazed by England''s Test and 50-over captain Andrew Strauss not being part of the national Twenty20 squad. Strauss has opted out of T20 cricket to ensure that he remains fresh for the other formats. England will be reluctant to pick him for the opening international against South Africa on Friday. In a major move, South African skipper Graeme Smith has decided to withdraw his name for the upcoming Champions League Twenty20. Smith, who plays for the Nashua Cape Cobras, is currently struggling with a leg injury. Confirming the development, Dr Mohammed Moosajee, South Africa team manager, said: "After much discussion and deliberation, the Proteas' management together with the medical committee of Cricket South Africa headed by Dr Shuaib Manjra have made a decision to withdraw Graeme from the upcoming Champions League in India." London, Sep 20 : South African skipper Graeme Smith has defended Andrew Flintoff decision to become a freelancer, and said like all professional sportsmen he wants to earn the best money he can. The decision of Flintoff to not sign a new contract with the ECB has sparked a massive club vs country clash of interests across in every major cricketing nation. “I don’t think you can blame Fred for the decision he’s made,” says Smith.